Dr. Hashem was born in Jeddah, Saudi Arabia and moved to Dallas, Texas when in his early teens. After graduating from Plano Senior High School in 1999, he commenced post-secondary studies at Collin College and proceeded to the University of Texas at Dallas. There, he received a Bachelor of Arts degree with Honors in the field of Biology in 2004. Mohannad continued to postgraduate education at New York University College of Dentistry where he received his Doctor of Dental Surgery degree in 2009. Following his education, he practiced as a general dentist for several years where his interest in digital dentistry and diagnosis has grown. During this time Dr. Hashem started providing continuing education in CAD/CAM dentistry and started his own software company. 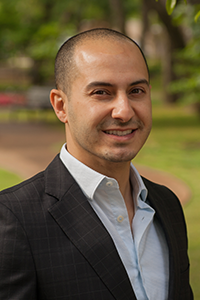 In natural progression, Dr. Hashem implemented a cone beam CT machine in his practice after which he decided to pursue advanced education in radiology. He enrolled in the Oral and Maxillofacial Radiology residency at the University of Texas Health Science Center at San Antonio and was admitted for the Master of Science degree at the Graduate School of Biomedical Sciences in 2011. During his time at the University of Texas Health Science Center, he received his specialty certificate in December of 2013 and his Master’s degree in 2014. Dr. Hashem is a member of the American Academy of Oral and Maxillofacial Radiology where he is continuing to practice full time in radiology and part time general dentistry. He is a peer reviewer for General Dentistry and has provided several continuing education courses in CAD/CAM dentistry. In his spare time, Dr. Hashem enjoys playing guitar and singing.